If you’re considering an interest-only loan, there are some pros and cons you should know about. An interest-only home loan can seem like an attractive option for some when figuring out how to finance your purchase, especially if it’s your first home. Keep in mind, however, that an interest-only loan is a product that will only be beneficial to people in certain situations and is by no means the best choice for everyone. 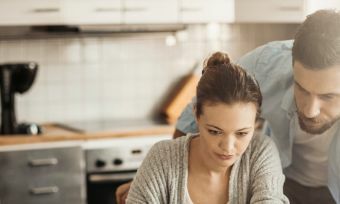 Read on for some of the reasons interest-only loans could be beneficial for some, as well as other reasons why they might be best to steer clear. An interest-only home loan is one where, for a certain period of time, you only have to pay back the interest accrued on your loan without any money going towards paying back the principal. Unlike a principal and interest (P&I) home loan, in which you pay towards interest and the principal every month, an interest-only loan gives you some time before you have to start paying back the amount you borrowed – typically around five years but can be longer. It’s important to remember after the initial interest-only period, your home loan reverts to a regular P&I loan, so you will eventually have to start paying back what you borrowed. The main difference is interest-only home loans result in lower monthly payments for the first few years of your loan, but this means you’ll be paying higher interest payments over the life of the loan. 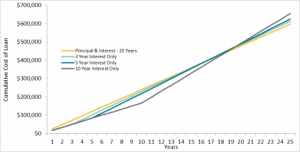 As a result, interest-only loans are usually best suited to people looking for lower payments up front, such as property investors or first home buyers; they’re typically not a good choice for households looking for the certainty of regular payments, and it’s important not to get drawn in by the prospect of low payments, as these will increase significantly in several years’ time. Check out the pros and cons below to see if an interest-only home loan is the best choice for you. The biggest draw of an interest-only loan is your monthly payments will be just interest for the first few years, meaning they could be significantly lower than if you were paying off your principal as well. This could be useful for first home buyers looking to reduce their up-front costs, young buyers who expect their income to increase in the coming years, investors planning to sell the property in the short term and some other life situations. For example, let’s consider a home loan of $250,000 at 6% interest p.a. over 25 years. On a principal and interest loan you’d be paying approximately $1,611 per month; with an interest-only loan, however, your payments for the first few years would be approximately $1,250 per month. That’s a difference of $361 per month, or $4,332 per year. It should be noted, however, that you will eventually be required to pay the full principal and you repayments further down the track will inevitably be higher than if you had been paying principal and interest. The interest paid on a home loan could tax-deductible if you use that home as an income-generating investment (i.e. by renting it out to a tenant). This means investors with an interest-only loan could potentially have their monthly payment be tax-deductible. An interest-only home loan could also be considered by investors or homeowners who plan to sell their property a few years down the track. If someone was expecting the value of their property to increase in the short-term, an interest-only loan could mean smaller monthly payments before selling and paying back the remainder. The inevitable downside of paying just interest for a period of time is you have less time to pay off your principal, meaning your monthly payments will inevitably become higher once your interest-only period expires. In fact, the higher payments mean you may end up paying more for your house overall than you would if you had a shorter interest-only term, or a normal P&I loan. 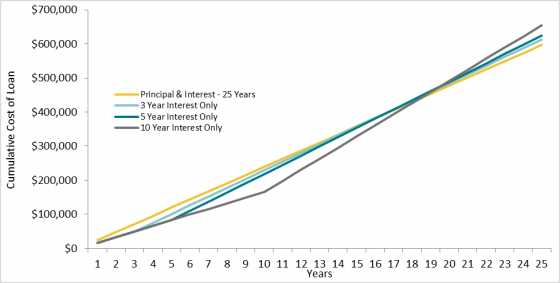 The following graph shows the cost of a $350,000 home loan over 25 years for four different loan types: principal and interest, interest only for three years, interest-only for five years and interest only for 10 years. The results in this scenario show a P&I loan would cost $596,813 in total, including $246,813 of interest. However, a 10-year interest-only loan could cost more than $58,000 extra over 25 years. The main pitfall of an interest-only loan is that it’s understandable customers may be tempted by the relatively low initial monthly payments– only to inevitably pay much higher payments after a few years once the interest-only period expires. This can be a shock that some people could be unprepared for, resulting in financial hardship. As a result, you should use caution when considering an interest-only loan; make sure you understand exactly what your payments will be throughout the life of loan and judge whether it’s affordable for your household. Since interest-only loans are relatively specialised products that only appeal to some buyers, they aren’t offered by all financial institutions. To see which banks offer interest-only loans and compare your options, check out Canstar’s home loan comparison tables. When interest rates are at historic lows – as they are at the time of writing – it’s a good time to pay down your loan principal. If budgeted correctly, consumers should be able to afford to do so as they are paying less interest. This means when interest rates do rise again, you’ll be accruing interest on a smaller loan amount. Is an interest-only home loan right for me? The people who may choose to consider this type of loan are property investors and first home buyers, as they could reduce up-front costs, produce tax-deductible benefits or minimise costs before eventually selling. An interest-only loan may not be your best option if you’re looking to live in your property long-term, as your payments will increase once you start paying off your principal and your loan may end up costing more overall. Overall, your financial situation is unique to you, so make sure you do your research, seek professional advice and carefully weigh up the pros and cons of an interest-only home loan to see if it’s suited to your personal finances. To compare different home loan options, check out New Zealand’s outstanding value home loans using Canstar’s home loan comparison tables.